It’s Time For This Week’s Late Update Again! I’ve gotten some good feedback, and used the extra time to make some edits – hopefully for the better. Now for the bad news, I’ve not managed to get the maps to display properly on the eReaders I’ve tested, and have decided not to include them for now. The maps aren’t really necessary for the Part One, in my opinion, as most of the story takes place within three major locations. That said, I will upload whatever maps I have to this site, once I’m happy with how they look. Also, I may decide to release a revised copy of Part One in the future, once I’ve ironed out the bugs with the maps. I’m going to allow myself two more days for any last minute edits, and will then be uploading it to Smashwords over the weekend. 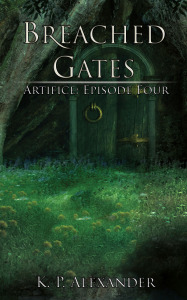 Artifice, Episode One, Update, weekly update. Bookmark. About to Hit the Button Tomorrow!